As we mentioned earlier, due to its 170W TDP the GTX 760 is essentially a drop-in replacement for the GTX 670 in board designs. Even NVIDIA’s reference design reflects this, with the reference GTX 760 being based on the reference GTX 670’s cooler and PCB. Consequently there’s not much to say about the GTX 760’s design that we haven’t said before. If you’ve seen a GTX 670 then you’ve seen a GTX 760, down to the last screw. For consistency we’ll quickly go over the GTX 760’s design, but this is generally a rehash of what we’ve already said about the GTX 670. 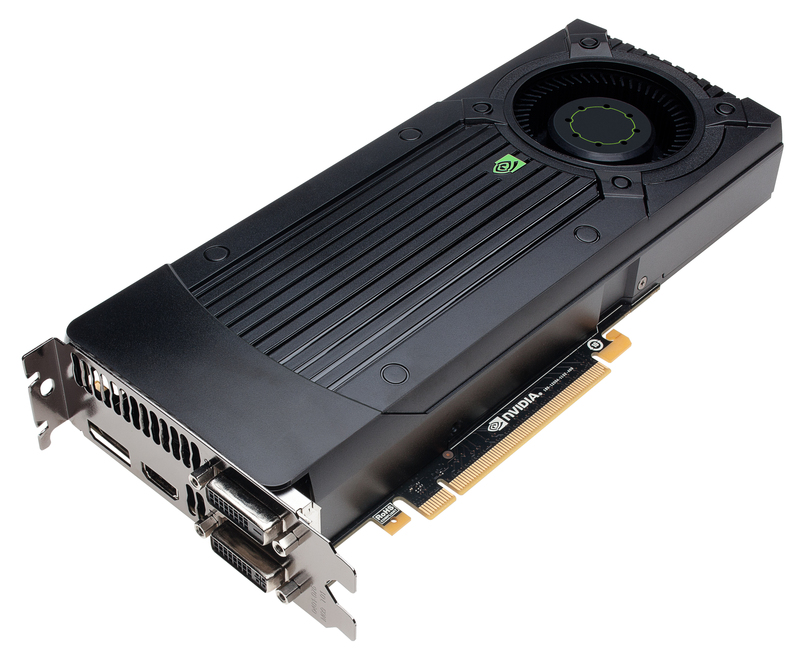 Like GTX 670 before it, GTX 760 is another “small” GK104 design. The complete card is 9.5” long, however the actual PCB is far shorter at only 6.75” long, 3.75” shorter than the GTX 770’s PCB. In fact it would be fair to say that rather than strapping a cooler onto a card, NVIDIA strapped a card onto a cooler. Meanwhile we see that once again NVIDIA is using Hynix R0C (6GHz) GDDR5 RAM here. The cooler itself is fairly simple, utilizing an aluminum heatsink melded with a copper base plate. A separate heatsink covers the VRM circuitry – once again mounted at the front of the card – while the fan hangs off of the rear of the card. This unfortunately is the same fan as on the GTX 670, which means it makes a faint grinding sound at low RPMs. 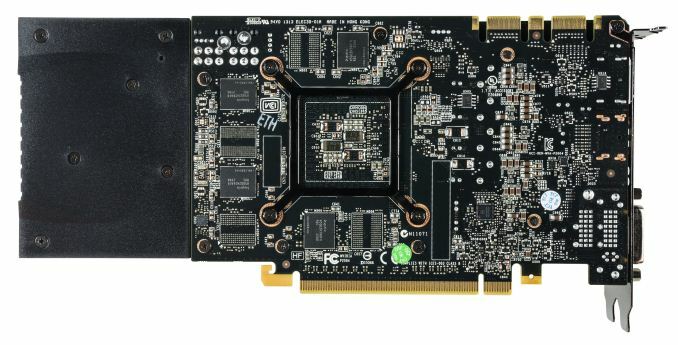 This design has proven more than adequate for the GTX 670s, though it does leave some room for NVIDIA’s partners to improve on overall cooling performance, especially with open air coolers. Elsewhere at the top of the card we’ll find the PCIe power sockets and SLI connectors. Two 6-pin PCIe sockets provide the necessary external power, while a pair of SLI bridge connectors at the other end allow for up to 3-way SLI. NVIDIA’s standard I/O configuration also makes an appearance here, offering 2x DL-DVI, 1x HDMI, 1x DisplayPort 1.2. Looking at clockspeed bins for a moment, it comes as no great surprise that like the GTX 770, the GTX 760 operates at 1.2v at its highest stock clockspeed bin. The higher voltage versus the 1.76v limit on the 600 series causes power consumption to jump up more rapidly at the highest bins, but is necessary to unlock the 1100MHz+ clockspeeds the card is capable of. Finaly, for overclockers there is one further bin (1162MHz) available via overvolting to 1.212v. The maximum power target meanwhile is 115%, for a final power limit of 195W.